FEAR Server supports both Windows and Linux. 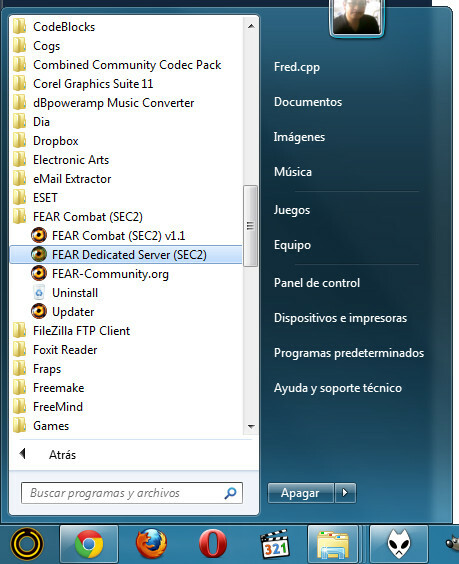 If you want to host a server in Windows, you can do It with the FEAR Combat Installer, but the prefered method is with the Dedicated Server package. This will run the server and show It in a small window. Now you can open the game and join in the LAN Section. For Linux, you keep the exact same process than before! You can also Add custom content and maps to your FEAR Combat Server. For special needs, like running multiple servers you may need to create a .bat file to start the server. Create a new text file in the game (or server) folder and name It MyServerA.bat for example. start fearserver.exe -optionsfile "%SERVEROPTIONSFILE%" +errorlog 1 +alwaysflushlog 1 +errorlogfile "%LOGF%"
Then create a shortcut to the file, It can be for example, in the desktop, so you have easy access to It. Use a specific “ServerOptions-TDM” txt file for ServerOptions. You can specify different options file for hosting several servers. Create a log file with date/time on the filename (for example: fearserver.tdm.2014-04-06_205924.log). Please note that this date/time format may be locale-dependant. You can change the path where you want the file to be created. When hosting more than 1 server, remember to use a different port for each server! Using the same port for more than 1 server will eventually make the Master Server Ignore all of the servers comming from that IP. Hosting Multiple Arch00 content Servers. Where ServerMod.archcfg is the name of the file containing the custom Arch00 file list needed for your modded server. And ServerMod_User is the folder, usually in the root game directory containing the AdditionalContent folder with the custom content you want. This should allow you to host as much as needed different server configurations while keeping a single setup game. 1) I can’t see my server In the ingame & FEAR-Community.org page! If you can’t see your server listed here, It’s being blocked by your AV/firewall. b) If you can see the server in the previous list, but not ingame, the server can reach the master server, but clients can’t. So you are behind NAT, and you need the proper port forwarding. This changes depending on your hardware and the way you connect to the web, so you need to google about It. c) I still can’t see my server, or my server stops responding after some mins. You may have too much custom content files added to your server. This is known to cause problems like this; To get a 100% responsive server, max num or custom content files, including mods and maps, should be maximum 10, with a players limit of 18 players. for 10 players you can add 1 or 2 custom files more. You can actually add more files, but this could make the server stop repplying once you get more players. This is currently being reseached, you can get more updates in this forum thread.